With so many opportunities these days for telecommuting and working remotely, it is more possible now to pack up and live in a place that calls to your soul. Read on for a list of 10 of the most beautiful places in the world to live. Santorini, floating in the Aegean Sea, is one of the most amazing places to live. Domed, white buildings among cliffs overlook the sandy beaches next to azure blue waters. The black and red sand of Santorini makes these beaches a marvel to enjoy. The villas in Santorini are beautiful and many have private pools. Every day is paradise in Santorini. Hidden in a remote mountainous region, the village of Shirakawa slumbers while the world whizzes past. The gassho-zukuri (farmhouse homes) with their peaked roofs look stunning in winter snow. It’s little wonder that Shirakawa was named a UNESCO World Heritage site in 1995. Vienna is one of the prettiest places to live in the world. But it has so much more than beauty to recommend it as a place to move to. Vienna has high educational, economic and lifestyle standards. If you are seriously considering relocating, learn more here. 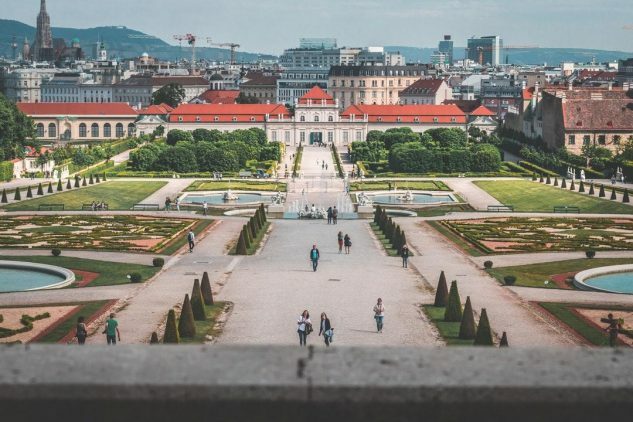 If you love stunning and intricate architecture, art, history and temperate weather, Vienna is the place for you. The Seychelles in Africa is a series of islands that is the perfect place to live if you love sand and sun. These 15 islands in the Indian Ocean are full of coral reefs, rare fauna and nature reserves. It’s one of the most scenic places to live with its mountain rainforests and countless beaches. If you are looking for the dream island life, you’ll find it here. This medieval city is one of the most amazing places to live for those who love charming views. The many plazas, excellent restaurants, cobblestone paths, and lush greenery are picture-perfect. If you are looking to get away from the speed of today’s modern world, you can do that in Giethoorn. Life moves at a slower pace here. In fact, there are absolutely no roads. You can walk, ride your bicycle or take a boat through one of several canals that run through the town. This tranquil town is by far one of the most scenic places to live. The thatched roofs, the abundant greenery, and the gentle canals will take your breath away. Burano, an island in Venice, Italy, is an Instagrammers dream come true. The brightly colored houses instantly brighten your mood. Enjoy seafood fresh from the lagoon at one of the casual eateries in town. Then, if you want to enjoy the nightlife, take a ferry to Venice. As far as beautiful places in the world to live, Burano is likely the most colorful. Like living in a box of crayons. If a gorgeous skyline is your definition of beautiful, Melbourne is one of the most beautiful places in the world to live. It’s not remote or quiet, like many of the places on this list. Instead, you’ll find plenty of dining options at incredible cafes, bars, and restaurants. The Victorian architecture, Yarra river and Queen Victoria Market will give you plenty to see and do. Here’s our second Japanese entry. Kyoto was once the capital of Japan. Here you’ll find dozens of classical gardens, palaces, Buddhist temples, and Shinto shrines. And during cherry blossom season, the city is transformed with an explosion of pink and white blooms. You’ll never get tired of these views, even if you live here for the rest of your life. Fiji has long been an exotic tourist destination. But it has more to offer residents. Pacific islands enjoy year-round warm weather, fresh seafood and access to the beach. If you’ve always wanted to live on the water, you literally can with an overwater bungalow in Fiji. If a chance to be alone to read, write and amble around is your idea of paradise, you’ll find it in Yvoire. This picturesque sleepy town has a population of just over 800 people. The 14th-century castle is perfect for sketching, exploring and photographing. The streets are lined with flowers and the fresh bread is in abundance. C’est la vie! We hope you enjoyed imagining life at all of these most beautiful places in the world to live. Got a bit of wanderlust? Check out the favorite travel destinations for 2019.